Occupation: Owner, Wonder Threads, Inc. When and why did you start Wonder Threads? Wonder Threads was officially started with the launch of the website in January 2006. I left the corporate design world to create a company based on all of the side projects I always had going on. Do you make all the products yourself? How long does the production process take? Right now I sew everything myself. Once a week, my intern Ket lends a helping hand with some of the cutting and card printing. Generally, all of my products are labor intensive and take quite a while to make. You told me that your cupcake-themed items (cards and onesies/kids' shirts) are among your best-selling items. Why do you think that is? Everyone loves cupcakes! Who could resist? 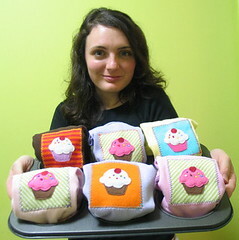 Do you plan to make cupcake t-shirts for women in addition to the kids' ones? So far, your products are only available online via mail order. Will they be in retail stores soon as well? Actually, my products can be found in a few stores right now: Monarch in NYC, Girlshop in NYC (soon! ), The Red Wagon in Boston and Poppy in Boulder, CO. I plan to keep adding to this list in 2007. You also work with customers on custom designs. Are those available only for the types of products you already sell? What's the most unusual custom design you've done? I'm open to all custom design requests, but I have not received anything all that unusual as of yet. I am currently making both Darth Vader and Yoda T-shirts for my friend's sons. I love it! Do you have plans to expand your merchandising? What would your ideal cupcake-themed item be? I'm always hoping someone will ask me to make cupcake birthday invitations with my little beaded sprinkle felt cupcake. That would be so cute! What do you think of the rise in cupcake merchandising, from Old Navy pajama pants to Johnny Cupcakes? Do you see it continuing to grow or peaking at a certain point? I think cupcakes are a new classic. There will always be a place for them. And now for some personal questions . . .
How often do you eat cupcakes? Not as often as I'd like. I had one a few weeks ago after my dentist appointment. Probably not the best for my just polished teeth, but I was right there on 9th avenue and Billy's Bakery was calling my name. Chocolate cake, chocolate frosting. Maybe some sprinkles on top. I love baked goods. Cookies, brownies, cake⎯all good to me. Cupcakes are the cutest of them all. I love cupcakes just as they are. I love to bake, but only allow myself to do so for special occasions. Much too dangerous otherwise! Eating cupcakes with friends is always fun. Especially if they are the cupcake in the ice cream cone variety, or the marshmallow frosting/chocolate dipped Hi Hat cupcakes made popular by Martha Stewart. Tough to make, but fun to eat!